(3)….2—Rochester Knighthawks* (10-4) Since having their 5 game winning streak snapped back on March 28th (Edmonton 16-3), the Knighthawks have won three in a row and have outscored the opposition 35-14. Stephen Keogh (4G), Dan Dawson (1G/5A) led the attack, while Matt Vinc stopped 29/34 shots. Rochester will play twice this weekend. Friday night at Colorado Saturday 9pm, then travel to Vancouver for a Saturday 10pm faceoff. (4)….4—Colorado Mammoth* (8-7) What looked like it be a tough game was anything but. Colorado fell to Rochester 14-5. Adam Jones led the scoring for the Mammoth with 2 goals. Mammoth look to have the #2 seed locked up in west, they can still get a 1 seed but must win out and Edmonton must loose out. Mammoth are in action twice this weekend. Friday night they host Rochester 9pm, then travel to Edmonton for a Saturday 9pm matchup. (5)….5—Buffalo Bandits (8-7) Big win on the road as they swat the Swarm 12-9. The win reduces the magic number to clinch the final playoff spot in the east to 2. Any combination of Bandit wins and Black wolves losses equaling 2 will give Buffalo the spot. Ryan Benesch (4G/3A) and Dhane Smith (2G/5A) led the Bandit attack. Bandits are off this week before playing twice on April 25-26. (7)….6—Vancouver Stealth (5-10) Stealth came into this past weekend with a five game losing streak, and it quickly went to six after a 14-7 loss to Toronto. Sunday they rebounded to defeat a struggling Black Wolves team 11-9. Eric Penney stopped 90/111 shots in the two games. Stealth hold a slim half game lead over Calgary. These two teams face off on May 2nd, the last game of regular season. 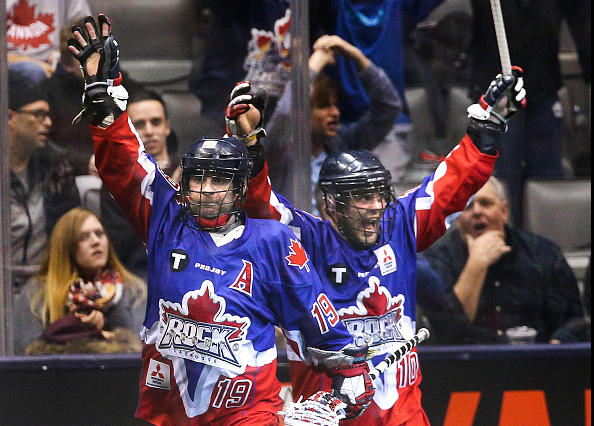 This week Vancouver will host Rochester Saturday 10pm. (8)….7—Calgary Roughnecks (5-11) In one day, out the next. That’s how quick the playoff race switches. Calgary took the final spot away from Vancouver for 1 day after defeating Edmonton 9-8 on Friday, but gave it back after falling 11-9 to Edmonton the next night. Calgary trails Vancouver by a half game for the final spot in the west, and they face each other the last game of the season. This week they visit the Swarm Saturday 8pm..
(6)….8—Minnesota Swarm (5-10) Was officially eliminated from playoff contention after falling 12-9 to the Bandits. Shayne Jackson scored 5 of the 9 goals for the Swarm. Swarm will host Calgary Saturday night 8pm.